Can the GP "effort" continue? 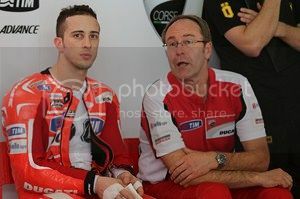 Speaking to MotoGP.com, Gobmeier said: "The level of performances we are seeing from our competitors is very, very high." Man... it's awful early for this already. I won't be all that surprised if the Germans bag the GP effort all together. Sad really, but the Japanese contingent fans seem to happy with Ducati's path of failure. Moving forward, I can't see how Ducati will recruit new team members with such constant negativity and signs of struggle in GP... if in fact the effort does continue. Thank god for WSBK... as long as Carlos can get a "grip" on his entry speeds. I think they'll be fine. A motorcycle is still a motorcycle, and the physics still work the same way. Ducati and Audi have smart engineers, they'll get there. It's just going to take some time because they have to change how they do things (methodically instead of throwing the kitchen sink at problems) and they're already behind Honda and Yamaha who have been doing things correctly all along. well put and I understand the logic. I think that one of the most interesting aspects of Ducati as a whole is that they choose to do things different and their own way. Does anyone think this may also be partly caused by the Italian life style? The Japanese work ethic is insane. Europe is all about workers rights. They probably take naps, they take months off in the middle of the year. How could they ever compete with the Japanese if they do not work like the Japanese. When I was over there every time I got tired I just had one of those handy dandy espresso things. I dunno what they do to them over there that we can't seem to get right here, but I could put together a few dozen Panigales single handed if they kept those things coming.